President Trump said in 2017 that drug companies are “getting away with murder." A bipartisan push from both sides of Capitol Hill kicked off Tuesday, examining the role pharmaceutical companies are playing in rising prescription drug prices. Both the Senate Finance Committee and the House Oversight and Government Reform Committee held hearings on the topic Tuesday. Tuesday, the House Oversight Committee heard gut-wrenching testimony from Antroinette Worsham, the mother of two Type 1 diabetics who struggles to afford insulin because of skyrocketing drug prices. Worsham lost her oldest daughter when she began rationing the medication, which cost $1,000 over three months. 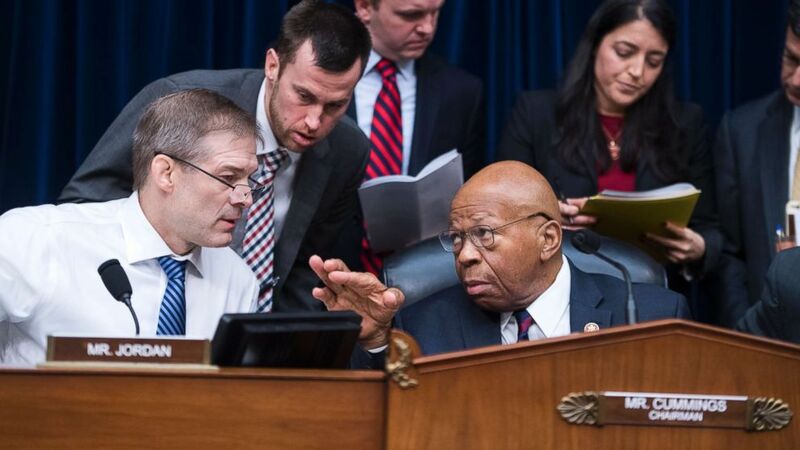 (Tom Williams/AP) Chairman Elijah Cummings and ranking member Rep. Jim Jordan conduct a House Oversight and Reform Committee business meeting in Rayburn Building, Jan. 29, 2019. An AARP analysis found that in 2017 the average price increase was 8.4 percent -- four times the rate of inflation. The administration has taken steps to crack down this very issue. Trump said during a 2017 cabinet meeting that drug companies are “getting away with murder” and pledged to lower drug prices. But that’s a tall order without draconian measures that Republicans would almost certainly oppose, like price controls. And so far, the industry’s lobbying operation has balked at any regulation attempts by the administration, including a simple requirement that drug makers disclose prices in television advertisements. Last fall, Trump proposed what many Americans would probably view as a small first step. The government, Trump said, planned to limit what it pays for certain drugs for Medicare recipients. The measure wouldn’t apply to the general public, only people who obtain certain types of drugs via Medicare. The drugs would have to be administered by a physician to be affected. The drug industry balked and said the administration was discouraging innovation. Drug makers say the high price of drugs is often due to the years of research needed to develop them. Now that Democrats are in control of the House, they could fundamentally change the nation’s political approach to healthcare, making it much more likely that additional states would move to expand Medicaid coverage for low-income Americans and push back on efforts by the administration to relax regulatory standards. Trump's Health and Human Services Secretary, Alex Azar, is a former executive at pharmaceutical giant Eli Lilly and Co., which faced criticism during his tenure for raising prices for its insulin products. Ahead of Tuesday’s hearing Azar reiterated the administration’s commitment to work in a bipartisan way to achieve the overall goal of lowering prices.